I’ve made a little bit of progress on the sock toes. I’ve started a thick/thin rib pattern on the instep. I’m almost finished with the increases. I’m slogging along. The yarn seems to be happy enough now. But I’m just not loving these socks. I’m thinking I maybe need a short, engergizing sock break. And so I think that, rather than actually knitting some other project that’s already in progress, I think I’ll cast on #1 Son’s blanket. You knew I couldn’t stand it, right? That yarn has been whispering to me. In the wee hours of the morning I hear it call me… Judy… Judy… why aren’t you knitting me? Just a short hiatus. Just one square, maybe, and then back to the socks, eh? Maybe something in a complex cable pattern – just to make the job of finishing more challenging – what ever it is I know they will be beautiful and done on time!! Obviously great minds think alike! 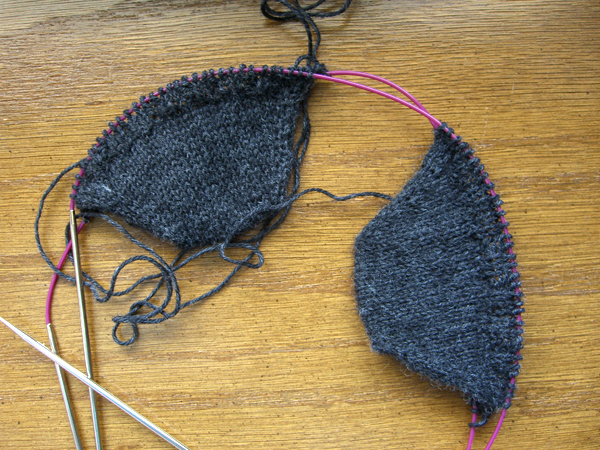 I’m doing the thick/thin rib on the foot, but I’m planning a little cable action on the ankle. They might not make it for Socktober, but they will be finished by Christmas. That and their companion pair, designated as Socktober #2. Alice earlier queried if #1 Son liked his Trekking socks. I had dinner with #1 Son last week and delivered the finished socks to him. He looked at them with surprise on his face and said, These are nice! And you were expecting what? I wanted to ask him. At any rate, I hope they fit (I have not heard yet) and they keep his feet warm. He said that the last pair I made him were a little big in the ankles. Those pair are cotton and have less “give” and these are wool and have more ribbing. So I hope they will stay up OK. I will report back. If not, next pair I’ll decrease more on the ankles. Is it my fault he has wide feet and skinny ankles? No… It’s not my fault. But I can knit with that in mind.